The galactic core can break free. 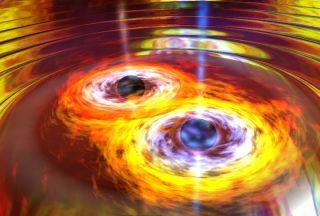 As two supermassive black holes spiral around one another and merge, they create gravitational waves. With enough energy, they can "kick" themselves out of their starting spot, or even completely out of their home galaxy. Like all black holes, supermassive black holes absorb all light and cannot be directly seen. Instead, scientists identify them by hunting down their gravitational effects on stars, gas and dust around them. But unlike the smaller black holes generated by single stars, supermassive black holes have somewhere around 100 times the mass of the sun. Because of their huge mass, their mergers should produce gravitational waves that the European Space Agency's Laser Interferometer Space Antenna (LISA) spacecraft will be able to detect after its launch. Intrigued by the connection to gravitational waves, Yashashree Jadhav, a graduate student at Rochester Institute of Technology in New York, began to search for supermassive black holes that were offset from the center of their galaxy. Jadhav is combing through a hundred galaxies imaged by NASA's Hubble Space Telescope to determine how many host off-center black holes. Jadhav presented her work in January at the annual winter meeting of the American Astronomical Society in Seattle, Washington. Most galaxies show some signs of having consumed another galaxy in their past. Even the Milky Way will one day merge with its neighbor, the Andromeda Galaxy, though not for billions of years. The two galaxies don't always blend smoothly, and infalling gas and dust can collide to spark new star formation. If both galaxies carry supermassive black holes at their hearts, there is a good chance that the pair will be brought together. But the two objects can put up a fight as they draw closer together. As the pair merge, they create gravitational waves. In order to conserve momentum, they also produce a kick that can knock the newly formed, merged supermassive black hole out of position. "Imagine the recoil of a gun," Jadhav told Space.com. "It's basically the same, just on a much, much larger scale." A simulation of a pair of merging black holes. According to Jadhav’s research, the newly merged body can travel anywhere from a few hundred to several thousand kilometers per second away from where it formed, depending on how much mass the original pair started out with. That means that scientists tracing a set of gravitational waves back to their source wouldn't see the newborn supermassive black hole; they would have to look off to the side to find it. The most powerful kicks can even hurl the young supermassive black hole completely out of the new galaxy, Jadhav said, a result that she calls "quite rare." The ejections only happen when one of the merging black holes is significantly larger than the other. Milder kicks can push the newly merged object more than 300 light-years away from the heart of the galaxy. Over the course of about a billion years, gravity will slowly tug the merged object back to the galactic center. Before Jadhav could determine if a black hole is off-center, she first needed to calculate the center of each galaxy. By comparing multiple archived Hubble images of the same galaxy, Jadhav was able to trace how much light was produced by all of the stars, then use that to estimate the collection's center of mass. Then, using near-infrared images, the researcher determined where the supermassive black holes actually lay and compared that location to the galactic centers. Of the 100 objects that Jadhav and her colleagues examined, they found that roughly 20 percent lie off-center, suggesting that they had been displaced by the merger that formed them. The next step is to use the results to help understand how often galaxies merge, a factor that Jadhav calls "arguably one of the more uncertain rates." She also hopes to use her results to better calculate how often black hole mergers should produce gravitational waves. The Laser Interferometer Gravitational-Wave Observatory (LIGO) has detected multiple gravitational-wave signals. Most of them were produced by merging black holes, although at least one came from the collision of a pair of neutron stars, the densest type of star in the universe. According to Jadhav, LIGO isn't able to detect the type of supermassive black holes that are heavy enough to generate a kick. That's because more massive objects, as well as those in wider orbits, release a longer wavelength than those LIGO is hunting.